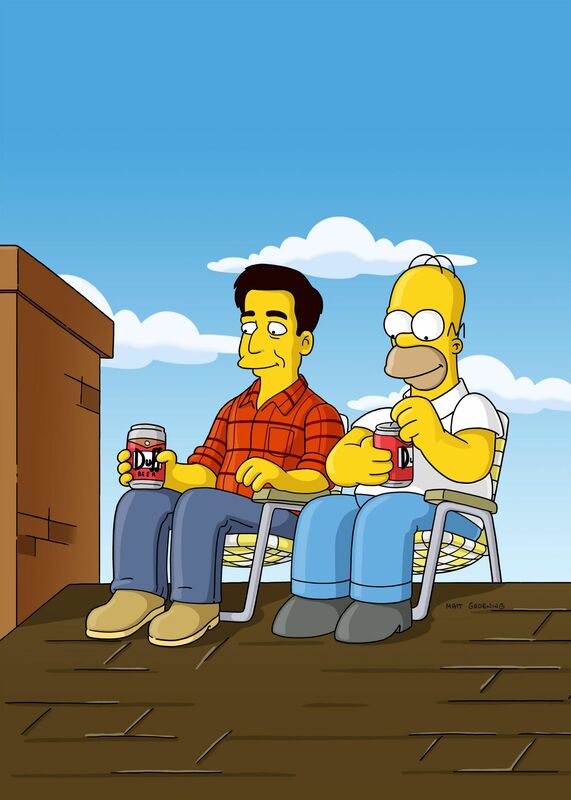 "Homer befriends beer-loving barfly and roofer Ray Magini, guest-voiced by Ray Romano. After discovering a shared passion for sandwiches and the Three Stooges, Homer and Ray become inseparable friends. However, Marge believes Ray is a figment of Homer's imagination and enlists the help of Dr. Hibbert to literally "shock" Ray Magini out of Homer's system." Springfield becomes the target of a powerful thunderstorm and 742 Evergreen Terrace appears to be the main target and causes a leak in the roof. Homer plans to use a "Hot Wheels" track to stop the leak but Lisa's hamster goes down the chute and goes out the door via the mail slot and then Lisa has to open it to get her hamster and then he gets sick as he was the subject of Lisa's show and tell project. The leak also affects Bart and Maggie and causes Snowball to fall in quicksand which was his litter box wettend by rain. Homer then goes to Moe's Tavern but there he ruins a surprise party for Lenny (Even though his 'ruining' it involved repeating what Moe said seconds before right before Lenny walks in, and sitting on a cake that looks exactly like a bar stool that's sitting on the floor not the counter) and is kicked out. Homer then goes to a bar named Knockers a parody of "Hooters" and there he meets a roofer named Ray Magini. Ray agrees to fix Homer's roof and while the kids go to visit Grandpa with Marge. Ray comes over to fix the roof, However, rather than fixing the roof the two goof offs and have a nail fight. The nails then hit Ned Flanders riding his lawn mower. Homer then asks Ned if he met Ray but Ned does not seem to know Ray. Ray then has to leave when he finds out his kid attempted "something" and Homer is on the roof all alone and then falls through the hole. Marge then returns home to find Homer doing nothing and Homer and Marge then have a discussion about Ray and Marge simply says Ray is non-exsistent. Homer is then sitting on the roof waiting for Ray to return while Marge tries to get Homer to believe Ray is a figment of his imagination. Ray Magini is also an anagram of "imaginary", leading Homer to belive that Ray was indeed not real. The next day Marge sends Homer and Bart to Builders' Barn and there Homer sees Ray however Bart only sees Homer talking to himself. The next day Marge takes Homer to the Calmwood Mental Hospital and Doctor Hibbert tells Homer that Ray is a figment of his imagination he created because he was lonely and needed a friend. Homer then spends six weeks at the hospital receiving electric shock treatment. After the six weeks Marge returns with a little surprise—Ray. It turns out Ray was real, and almost everyone had explanations : the bartender at Knockers had an eyepatch and could only see Homer's side of the table and Ray was hiding behind the roof when he saw Flanders, but nobody can explain why Bart never saw Ray at Builders' Barn. Luckily, Stephen Hawking arrives and explains that a tear in the time-space continuum mixing in with flying pieces of metal created a miniature black hole, preventing Bart from seeing Ray. Ray then explains why he kept dissapearing, he's a contractor. However, as punishment for making Homer spend six weeks in the mental hospital, Homer forces Dr. Hibbert to fix his roof while Homer and Ray sit on it drinking beer. In the meantime Marge and Lisa, visit the Retirement Castle and they see how miserable the old people are and then they see how happy they are with Santa's Little Helper's company and let him stay there for a while but a day later he has become just as old and miserable as the seniors. Modified on July 15, 2017, at 08:33.